Droplet is a small musical toy created by John Croisant in 72 hours over the weekend of June 26-28, 2009 for the third RubyWeekend game creation competition. The theme of the competition was “A Tiny World”. The inspiration for Droplet comes from photographs that people have commonly described as “tiny worlds”: droplets of water, and the small plants and fungi that grow underfoot. 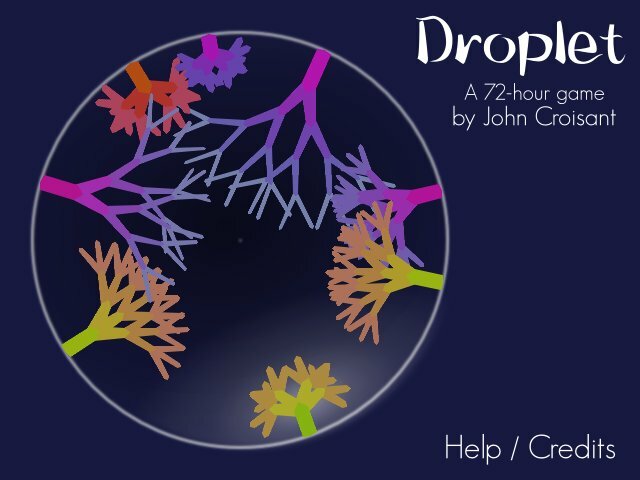 Initially, Droplet was going to feature both plants and creatures interacting in their tiny droplet world, but I abandoned plans for the creatures due to time constraints. So, what's left is abstract, rainbow colored plants that sing when you tickle them! Left click anywhere on the edge of the droplet (the large circle) to plant a seed. The seed will gradually grow into a tree-like plant of a random color. Move the mouse cursor around near a grown plant to tickle it and make it sing. The faster and longer you tickle, the louder it sings. The sound each plant produces is randomly chosen from the “data/sounds/” directory. Right click the trunk of a plant to remove it. Click “Help / Credits” to view controls help and game credits. Press Escape to quit the game. To run Droplet, you will need Ruby 1.8.6 (1.9 might work), Rubygame 2.5.2 (with SDL_gfx, SDL_image, and SDL_mixer support), and Gamebox 0.0.4.